Personalized 1 Corinthians 13 Love is Patient Journal. Custom Name. Christian Bible Verse Gift. Bridal Shower Anniversary Wedding Gift Idea. Please add the name you would like on the cover. If no name desired, write "None". The perfect PERSONALIZED 1 Corinthians 13: 4-8 Journal Book featuring some of the most famous words about love ever written on the cover. Are 1 Corinthians 13: 4-8 your favorite Christian Bible Scripture verses? 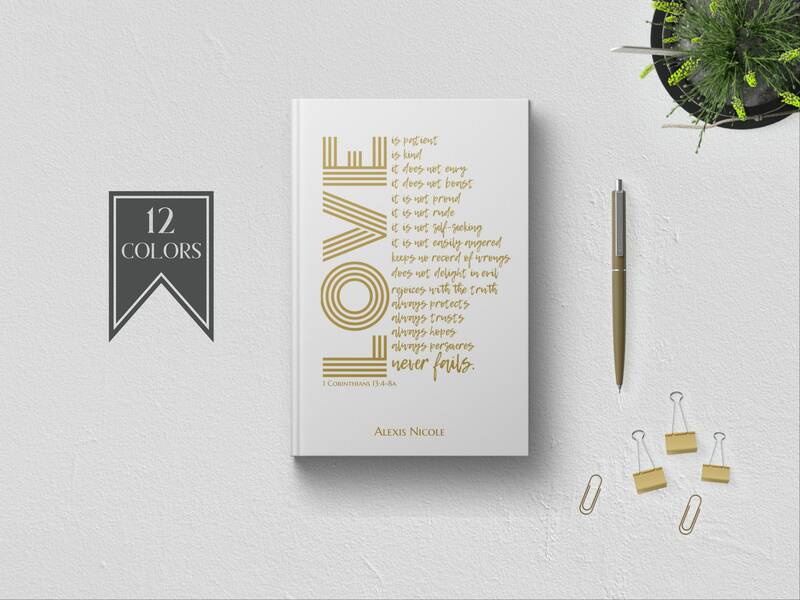 Bring the Word with you wherever you go with this blank lined notebook features the words "Love is Patient. Love is Kind. Love Never Fails." on the elegant cover. Each lined page has the motivational Scripture verse at the top to inspire you to always believe in what you can accomplish through Christ. "Love is Patient. Love is Kind. Love Never Fails." Notebook Journal to write in is the perfect Christian gift to give to anyone wanting a reminder of some of the most famous words about love ever written. Can be used as a personal diary, writing journal, or to record your personal thoughts, goals, prayers, things to remember, or to capture all of your creative thoughts. Makes the perfect Wedding or Anniversary Gift! Also makes a great gift idea for engagement gifts, confirmation gifts, bridal shower gifts, birthday gifts, Mother's Day gifts, and Christian gifts for just about any occasion.